We hope to complete on our house sale soon which means I am harvesting vegetables in the Telford garden sooner than I would normally do. On Thursday it was the turn of the yacon. 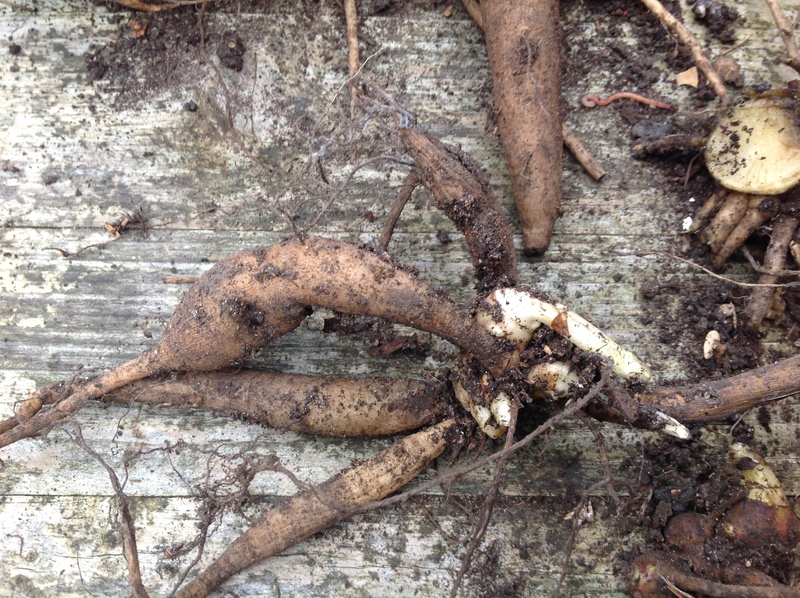 I broke off the edible tubers – the long pointy ones in the picture below – and then set about taking apart the growing shoots for next year’s plants. Because I am harvesting early these roots are quite small for yacon, but you can actually see the growing points which are harder to show on larger roots. I usually use a knife to cut them up as they are quite hard, but I did find when I got to the last plant that it is possible to break them apart. I had hesitated to do that before now as I thought I might break off the actual growing tip if I had to wrench too hard. However breaking seemed to work better than the knife. I have planted the cut and broken parts in nearly dry compost and will find a cool but not cold place to over winter them in the dry. As I was trying to find enough pots for the yacon pieces I thought of putting some of the pieces back into the garden. I knew they would not be able to grow, but choosing not to take everything (and not just through a lack of pots) would be indicative of my thankfulness to the garden, to nature, for what I had been able to make use of in the first place. It was at that point when I saw, for the first time, some point to the practice of some religions to make offerings of food and drink to their gods. I have always been keen to maximise the yields I get from the garden, to harvest as much as I can to eat and to save as many seeds and other parts to grow for the following year; not doing so would have just seemed like waste. Now I can see such offerings as a tangible way of saying thank you, to give back something I could use, but choose not to. I guess it takes to learn earth style wisdom – that natural abundance is more than adequate for human needs and by holding back from taking everything is a recognition of this and a way of demonstrating actual trust in it. 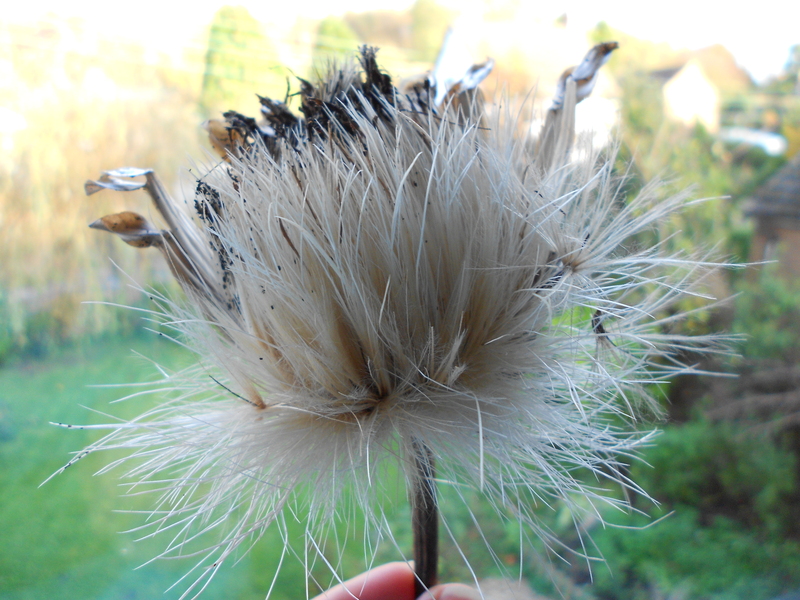 How many seeds might there be on this lovely cardoon head? Far more than I could ever use that’s for sure. Author of Edible Perennial Gardening and avid researcher into edible perennials and associated useful plants. This entry was posted in roots and tubers, Telford Garden and tagged natural abundance, offerings. Bookmark the permalink. I have a custom of giving the first fruit back to nature. Even if I’m out picking wild blackberries, the first handful I get I give back. It is, as you mentioned, a sign that I trust more will be provided, and an acknowledgement that what I am harvesting is nature’s, whether I grew it or not. I appreciate you pointing that out.